Good news for all the Samsung GALAXY Note 3 SM-N900 users, now they can update their phone with the latest Android 5.0 Lollipop firmware. The firmware is official and packed lots of new lollipop features and improvements. Yes It’s Official now, no need to run behind leak. 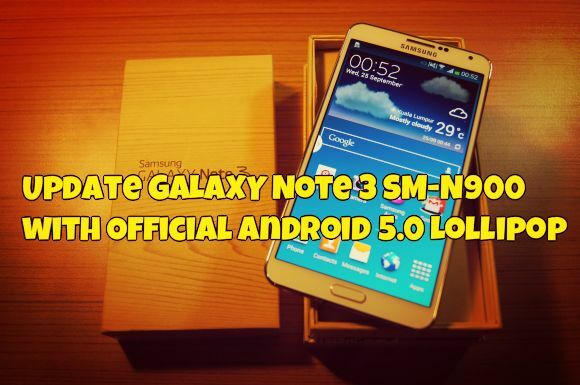 So if you are Note 3 SM-N900 users and want to update your device with this latest firmware, here is the complete guide which you follow on your Windows PC and Note 3 and install the same. The official build is a direct release from Samsung with all the Lollipop features along with it and is already claimed to be stable. Before following this guide do take the backup of your phone and save it ins some safe place. Charge your Note 3 to at least 60% battery life to avoid any uncertain shutdowns during the procedure. Also install the latest Samsung USB drivers on your Windows PC from here. Step 1. Download the latest Android 5.0 Lollipop for GALAXY Note 3 SM-N900 here and extract the folder on your desktop. Step 2. Download ODIN v3.09 which will help you to install Android 5.0 on your phone. Step 3. Now boot your device in Download Mode. TO do this Press and hold the Volume Down + Home buttons together, and then press the Power button till you see the construction Android robot and a triangle. Press Power again to confirm to enter into Download Mode. Step 4. Now connect your phone to the pc with USB cable and run the ODIN application on your desktop. Step 5. Add the firmware file to AP / PDA. And make sure that Auto Reboot and F.Reset Time check boxes are selected in Odin. Also, ensure the Re-Partition option in Odin is not selected, check it ONLY if you selected a .PIT file in the above step. That’s it. Your GALAXY Note 3 SM-N900 has now been updated to Android 5.0 firmware update. Go to Settings > About phone to verify.